For live updates (mostly in Spanish and Catalan), follow #HuelgaGeneral, #29M, @acampadasol, @acampadabcn, and @occupybarcelona. For English, see @acampadabcn_int. Across Spain today, the 99% are rising together in a national General Strike in opposition to the government's pro-business labor reforms and funding cuts to education and other services. In a country where over half of young people are already unemployed, these austerity measures - created solely to appease un-elected European Union bureaucracies and used to protect the interests of powerful international banks and wealthy investors - would demolish decades of hard-won labor rights by making it easier for companies to lay off employees and unilaterally cut wages. But, like their counterparts in Greece, the Spanish 99% are not responsible for the financial crisis. And they refuse to see their rights stolen to line the pockets of the very banks and institutions who did cause the economic system to collapse - the people who run it: the 1%. Today, the people of Spain are fighting back: across the country, workers left factories and picketed markets, protesters blocked roads, TV stations were forced off-air, flights were cancelled, and train stations closed. The Spanish state has sent in riot police to attack protesters. Only minutes after midnight and the start of the strike, dozens of people had already been arrested. Tomorrow, Spain's government is expected to release a new budget that will cut billions of euros in measures supposedly designed to stim Spanish debt and ¨encourage investors.¨ This is the same rhetoric used to excuse the unfair cuts to education, infrastructure, and safety net programs here in North America. It is the same misleading language used by corrupt politicians across the world who, working for the bankers and investors who pay for their election, ram through massively unpopular bailouts and austerity measures that only hurt the 99% to benefit the 1%. But, as we have seen from Wisconsin to Wall Street, the people are not sitting idly by to watch their rights and livelihoods be stolen by the ultra-wealthy. The Spanish Acampadas/indignados movement helped inspire us to Occupy. Today, we send them our support. And on May 1st, we will show our solidarity with Spanish protesters, and all others across the world, by taking the streets. 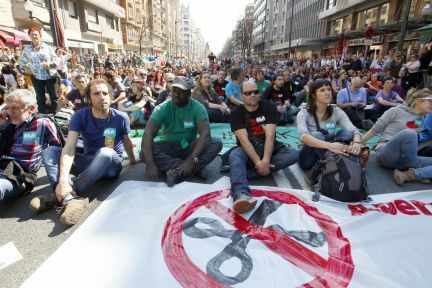 Unfortunately, U.S. laws make it illegal for unions to endorse a General Strike like the one happening today in Spain. But we, working with our partners in labor and immigrant rights organizations, can. This May Day: No Work, No School, No Housework, No Shopping, No Banking - TAKE THE STREETS! Here are six ways you can get ready for the May Day General Strike. Against the Labor Reform, the cuts, and the assaults on the working class. The CNT rejects any kind of negotiation over the rights conquered by the working class and demands the repeal of the Labor Reform. The CNT’s confederal committee has decided to call a 24-hour general strike for March 29, which will extend the call that has already been made for Galicia and the Basque Country. This call will be formalized in the coming days. The CNT rejects any kind of negotiation over the rights conquered by the working class through years of struggle. We call for this strike with the primary objective of immediately repealing the the labor reform that was approved yesterday by the Parliament, which we consider a head-on assault against the working class. This reform continues the measures started by the previous government, such as the labor reform of 2010 and the cuts to public employee salaries, to pensions, and to public services, cuts which are being deepened by the current government. The CNT demands the end of an economic policy designed to make the workers pay for the crisis of the banks and the employers. This policy has led to an unacceptable number of unemployed workers, a number which does not stop growing, as well as to an impoverishment and worsening of the working class’s living conditions. The CNT also calls this strike against the cuts. The strike will happen the day before the setting of the General State Budget which will incorporate a brutal attack against public services and social rights. The CNT rejects the agreement reached in February between the CCOO and UGT unions and the employers’ confederation, the CEOE, as well as the amendments that those unions have presented to the parliamentary process of the labor reform. The CNT rejects these amendments as a valid alternative, since they share the spirit of the reform and assume the logic of the employers and the government, who suppose that the only escape from their crisis must come through the workers surrendering their rights, placing the working class into a position of weakness from the start. The same logic has already led these unions to accept the raising of the retirement age to 67, even after the general strike of September 29, 2010. All of these reasons have led the CNT to make this call for March 29 on its own account. With this call the CNT wants to give coverage to everyone who is taking up positions for a real and continued confrontation that will pay back the assaults on the working class with the same force with which we are receiving them, together with all workers’ organizations that share these objectives and reject the policies of agreement and social peace. 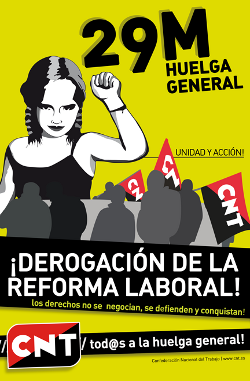 For the CNT, a confrontational rejection of the policies and the bureaucratic union model of the CCOO and the UGT, and their discredit among broad groups of workers, must not become excuses not to take action or struggle. Instead, this rejection must spur us on to reinforce our struggle through a different form of unionism – one based on direct action, on autonomy, and on mutual aid. Against assaults of the magnitude that we are facing, working-class unity is fundamental. This unity must take place in the rank-and-file, in workplace and neighborhood assemblies, in industrial actions and pickets, until the mobilization against those who are responsible for and benefit from this situation – the employers, the banks, and the government – is turned into an unstoppable dynamic that raises a barrier against the temptation to turn the rights that belong to everybody into a bargaining chip that belongs to nobody. It’s time for all workers – unemployed or employed, retired, on the black market, students, and the precarious – to say “Enough!” We must seize the streets rather than abandon them in order to impose our strength and our demands. March 29 – everyone in the street, everyone in the strike. Participar de manera masiva en una protesta, y hacerlo evidente para tus jefes, tus compañeros de trabajo y para los usuarios de los productos y servicios resultado de su jornada de trabajo... es algo que resulta atractivo, y muy emocionante, un poco más emocionante que las protestas en las que solemos participar los fines de semana, a las que acudimos en nuestro tiempo libre, y que al final acaban siendo irrelevantes para aquellos que no participan en ellas. Hacer huelga y sentirse orgulloso de ello es como quitarse la careta y gritarle a todo el mundo que no estás de acuerdo con la situación. Gritarlo muy alto para que se enteren todos, incluso aquéllos a los que no les guste tu forma de pensar o de actuar. Que se enteren todos. Quizás eso pueda animar a otros a unirse. Además, es un buen momento para recuperar la voluntad individual, para volver a "hablar de política" en cualquier foro, incluso en el trabajo, que parece ser un terreno prohibido. Las decisiones que toma el gobierno nos afectan a todos en muchos ámbitos de nuestras vidas, podemos hacer pública nuestra opinión, incluso en el trabajo. Tenemos el derecho de decir lo que opinamos, de gritarlo a los cuatro vientos, tenemos el derecho a hacer huelga. ¡Haz huelga y dile a todo el mundo que se una a ti!!!! Si es necesario, recupera al día siguiente las horas de trabajo perdidas, pero respeta el día de huelga y no vayas a trabajar. Y pon tu mejor cara! deja que vean que eres una buena persona, que estás comprometido con tu trabajo, pero que no vas a permitir que te quiten tus derechos. Así que toma las calles, acude a manifestaciones, participa en performances callejeras, canta, baila, llena las calles de ritmos de tambores, disfruta de un feliz Día de Huelga!!!!! To participate massively in a protest, and and let everybody know about it- your bosses, your workmates, and the users of the output of your daily working day... is something attractive and very exciting, a little more than the protests we usually take part in at weekends, that go in your spare time and end up being irrelevant to those who do not participate in them. To strike and feel proud of striking is like taking the mask off and shouting at everyone that you do not agree with the situation. Scream it for everyone to know, even for those who may dislike your way of thinking and acting. Make them aware of your opinion. Perhaps it will help some others to join you. Furthermore, it is a good time to recover your individual will, to get back to 'talking politics' in all forums, even at work, which seems to be forbidden ground. As government decisions affect us all in many areas of our lives, we can make our opinions public also at work. We have the right to give our opinion, to shout it from the rooftops, we have the right to strike. Do strike and tell everybody to join you!!!!! If necessary, make up for the the lost hours the day after, but respect the day of strike and do not go to work. And look your best, let them know you are a good person, that you are committed to your work, but that you're not going to tolerate loosing your rights. And take the streets, go to marches, take part in theatrics, dance, play drums, sing, have a happy Strike Day!!!!! I am an activist from Spain, I just came back from the general strike - both a work and consumption strike, we don't work, we don't buy, we don't use energy - which was a massive success indeed, with a high degree of unity and cohesion from a myriad large and small civil and worker organizations and also 15-M popular grassroots assemblies. The general strike is the most powerful tool the workers have, is an inmediate interruption of the system and increase awareness of how the population holds indeed the power over it. Watching the streets, means of transportations, airports, stores, factories, universities empty, the overall level of consumption dropping down greatly, is an excellent way to remind the elites and ourselves who indeed makes life in society as such possible - who, after all, in very specific ways, makes the system work, and has the power to disrupt it. We'll go to the end to defend the dignity of the 99% and the fundamental rights which were gained with long and persistent struggle and sacrifice from previous generations. Except that America has AMERICAN finance workers handling our books and we are not as worse off as Europe. In socialistic counties like that people get 3-4 week vacations and everything is given to them even when there is not enough money to fund their healthcare programs. If our free market economy which is the best, but you all say it is horrible and socialism works. Socialism is glorified Communism, it just doesn't have all the oppression Communisim brings. Face it, all Communistic governments have failed our are in absolute horrible shape. The Euro to, so is it Ameircan finance workers fault that the Eruo is defaulting? These statements are horribly misdirected. If you want to be socialist then why not move over there. America has been pretty good off with a free market economy. So take you're liberal agendas elsewhere. I'll beg to differ. we are as fucked as Europe, it is just that our American exceptionalism has blinded us to the reality. Never trust a money grubber near the public coffers. The lesson of our era. Who destroyed gov't, both America's and Europe's? Wall Street. lesson learned. Also JesseHeffran,if Wall Street gets to start the ETS[emissions trading scheme]it will steal every thing from the worlds Sovereign Wealth Funds and their Superannuation schemes.They have not stolen it all yet hence the bailout of their worthless derivatives by the equally corrupt Bush government and continued by the non prosecution of the Kleptocrats by the Obama government. We need more than strikes and protests. We need a new vision for the world. I am overjoyed to see this! I wish you the people of Spain the best of luck. I wish it was like this here in Italy I hope that this will encourage more people in Europe and thew world to get involved. don't give in what ever happens keep this up till we've won completely. you have my complete gratitude and I pray daily for you safety and success. muchas gracias queridos amigos! Global Revolution Now! Use the Hunger Games as an educative device. Hand out leaflets at screenings that get to the visceral reaction towards the elite that siphons off the lives of the poor in this country, and the despised masses in other countries who are our virtual slaves. They claim to be for life, but they only want more slaves to be born that are dead the moment they emerge. Well you are stupid. Our currency is not defaulting, and our economy is not on the brink of a complete and total economic flip over. Please respond, I really want to understand how you can think this. Ok listen up, Spain is a Socialistic government. That is why there economy and all of Europe's economies are failing. All you who want socialism just look at Europe and Spain. Socialism doesn't work and this is a real life example of it. Actually those nations are failing because they were stupid enough to allow american finance workers manage their books. The lesson to be learned is never allow a free market financier anywhere near the government books. the coup d'état that wall street perpetrated on Europe is kinda reminiscent of Wall Street's financing of the White army to fight the red army during the Russian Revolution. Never trust a free market fundamentalist near the government coffers is a good lesson to be learned.